Remember the invites for participation in a soak test of a new software update that Motorola sent out last week to owners of the T-Mobile (unlocked) Moto X? Remember how we had no idea what it was? We now know. It’s Android 4.4.3 and what is more than likely a new record for an Android version update for non-Nexus or Google Play Edition phone. The update, as can be seen in the screenshot above, not only includes Android 4.4.3, but introduces improved image quality and the ability to pause video while recording, as well. Users will also see the new dialer application that we highlighted yesterday, plus support for Motorola Alert, an app that was previously an exclusive to the Moto E.
Keep in mind that the T-Mobile (unlocked) model of the Moto X is controlled by Motorola, so it can easily push updates to it, which is why they were able to do this so fast. The other variants (AT&T, Verizon, and Sprint) will need to go through that whole carrier approval processor that often slows things down. Still, pretty impressive, right? 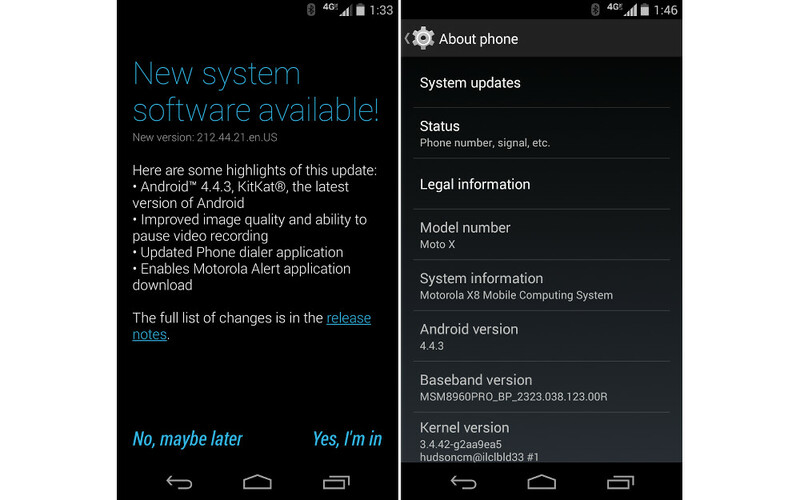 Update: Motorola has now announced Android 4.4.3 for the Moto G and Moto E as well, along with confirming the update for the T-Mobile variant. Moto E users who bought online in the U.S. and Canada. For Moto E users, you are still up for the next major Android update as well. Consider this the cherry on top. Improved camera image quality for Moto X including better consistency of exposure, more realistic flash coloring, and improved photos in low light conditions using front camera. For Moto X and Moto G, pausing for video recording with a convenient pause/resume button on the viewfinder. Motorola Alert in this update for Moto X and Moto G users. This new app helps give peace of mind by sending periodic messages to the contacts you choose. Sony Announces the Xperia T3, its "Next Big Thing"